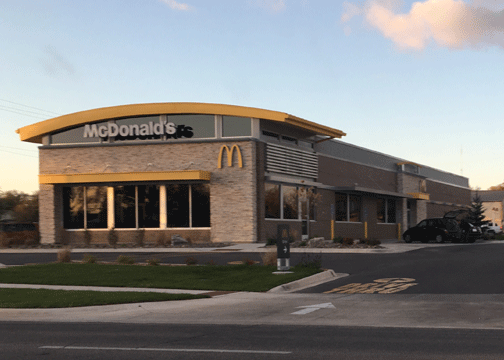 Our Stores :: Lane Enterprises, Inc.
As you drive by your neighborhood McDonald’s, it signals something in your brain; the taste of a hot French fry, the warmth of a cup of coffee, or the savory sweetness of sweet n’ sour sauce on a crispy nugget. We’ve all been there; the temptation triggers a Pavlovian response that we can’t resist. What you may not think about, however, is who is behind this store. It’s your neighbors, your friends and family that make McDonald’s who it is today. That is no exception for the people of Lane Enterprises. With thousands of employees throughout 38 stores in Wichita, Hutchinson, El Dorado, Emporia, Arkansas City, Augusta, Winfield, Belle Plaine, Pratt, Kingman, Great Bend, Anthony, Goddard and Derby, Lane Enterprises is a family-owned and family-oriented company. Many of the Lane employees have dedicated more than 20 years of service to McDonald’s. Visit our About Us page and see whose friendly faces are running your local McDonald's. And next time you’re passing through, take the time to say hello before you take your burgers and fries.